New Year’s Eve 2016 at Yotel, New York City’s ultra-chic hotel located inside Times Square will dazzle with holiday splendor. Flaunting 20, 000 square feet of stunning event space and the largest heated outdoor terrace, Yotel is the ultimate party palace. Yotel is an international sensation known worldwide for artfully and uniquely engineering interior space; their sleek, smart design creates a sophisticated backdrop for an unforgettable New Year’s gala. Yotel brings you a New Year’s Eve affair to remember. Indulge in the flowing libations at the 5-hour premium complimentary open bar from 9pm to 2am; the enticing hors d’ oeuvres served from 9pm to 11pm and dance to the sounds of our top DJ spinning sets of house, top 40, pop, hip-hop and mash-ups throughout 6 fabulous rooms: the Dojo Lounge Main Room, Club Room, Club Room Private Cabanas, Studio Room, Green Lounge, Club Terrace and Dojo Terrace. For those with VIP tickets, you’ll have access to exclusive VIP areas offering table and bottle service with hors d’oeuvres at your table or grab a private cabin, a truly luxe setting for you and your guests. 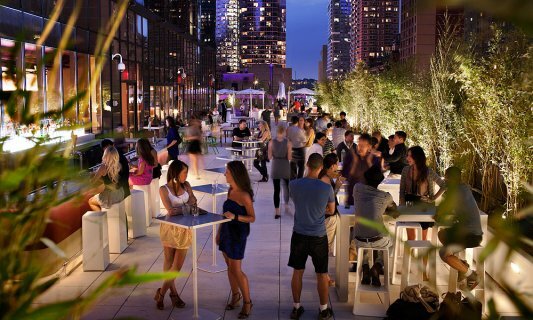 To experience Yotel’s phenomenal terrace, standing at 7, 000 sq. ft. lined with trees and minimalist furnishings enjoy Club Terrace and Dojo Terrace VIP tickets. For couples wishing to have a more private NYE moment, Yotel offers a special package for two with champagne and premium seating. No matter your choice, all Yotel guests will be toasting the New Year’s as they view the world famous Times square Ball Drop on hi resolution panoramic video screens. For a high pitched, high energy New Year’s Eve party in a fabulous setting join us at Yotel, NYC Times Square.